SCAMMER ALERT - I write sweet and steamy rom-coms with tear-jerker happy-ever-afters. So...I'm going to be as brief and concise about this as possible because it's just truly saddening to learn about being made part of a scam that cons people out of their money. I used to work for DOMINA MCKENZIE or whatever her name is. She was really great to work for at the start. But eventually, payments were delayed more often than not that I just stopped writing for her. She still owes me money and I still had PENDING BUT UNPAID WRITING ASSIGNMENTS to submit to her - who do you think is in a worse position? Anyway, long story short I just quit and didn't go after the money she owed me for articles. 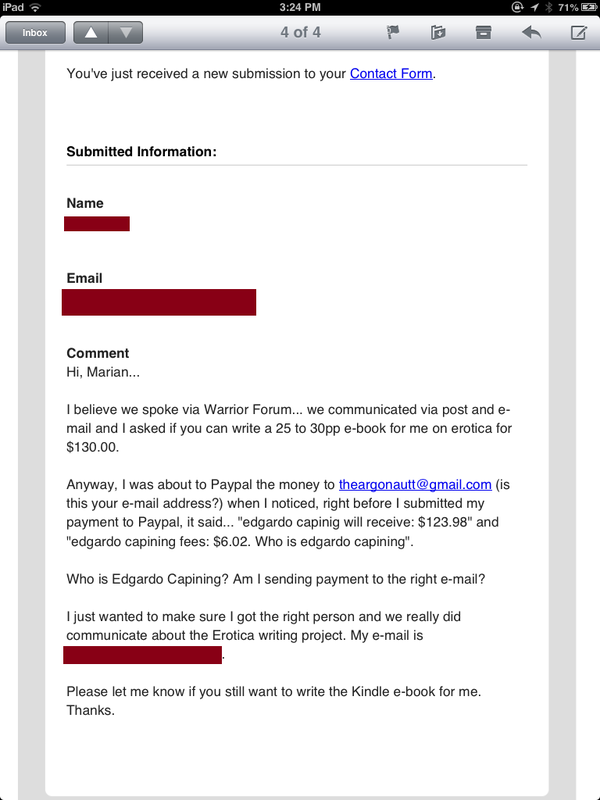 After some time, I received a notification from PayPal about her disputing the money she paid me for articles I sent on time in the past. =/ So I disputed her claim, sent my own evidence to PayPal, and she withdrew her claim. She does NOT even write or sound like me. If you've read my books, chatted with me on Facebook, I don't even use the word KINK to describe my novels OR refer to myself as a chick (because frankly I think it implies something else, and that something else is not how I see myself). Oh and just in case you want to know the scammer or fradulent writer posing as Marian Tee on the Internet - here she is. Her real name is Garynelle Maxine Capinig but she uses various aliases including Domina, which was the one she was using when I was writing for her. Oh, and they're on Facebook, too. If you look hard enough, you'll see her and her dad - or whoever Edgardo Capinig Sr. is. I'm honestly sorry if some of the people reading this hired her thinking that they were hiring me. I'm sorry about that but there's nothing I can do except let you know that it's not me and perhaps you can get your money back using this post as proof. It's been ages since I last wrote an article for someone and I have NEVER written an erotica book for anyone except those published under my name. It's funny, really - this person's been saying in WF that "her books on Amazon" aren't doing well and so she's resorting back to writing books for others. Mmmm.......up to you guys if you think it's true. All I can say is that my readers will KILL me if I take time off to write articles or anything that doesn't have anything to do with my upcoming titles.